Slice the potato into ± 1/16” thickness. Slice about half way down to the bottom, do not slice it through. Place the potatoes in baking dish and sprinkle evenly with salt, pepper and olive oil. Nuke the butter in the microwave (just to melt), then add the rest of the ingredients and mix well. Once potatoes ready but still hot, pour the lemon juice over the potatoes, then divide the butter mixture evenly and pour over each potato. 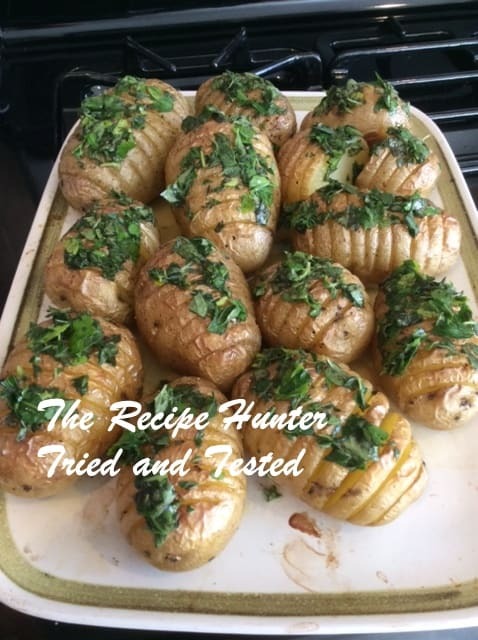 Modified, Prepared, Tried and Tested by The Recipe Hunter (Cook & Enjoy) ‘s Daughter-in-law.